February half-term skiing is a popular pursuit for many British families seeking more than a sun lounger and swimming pool from their holiday. France, Italy and Austria are popular winter sports destinations for Brits, and their relative proximity combined with the hassle of navigating airports while heavily laden with all the luggage a skiing holiday requires means driving to the slopes is becoming an increasingly popular option. However, it’s not all plain sailing. In the run up to Christmas 2014, 15,000 cars were stranded in the Alps when a sudden heavy fall of snow caught local authorities and police napping. 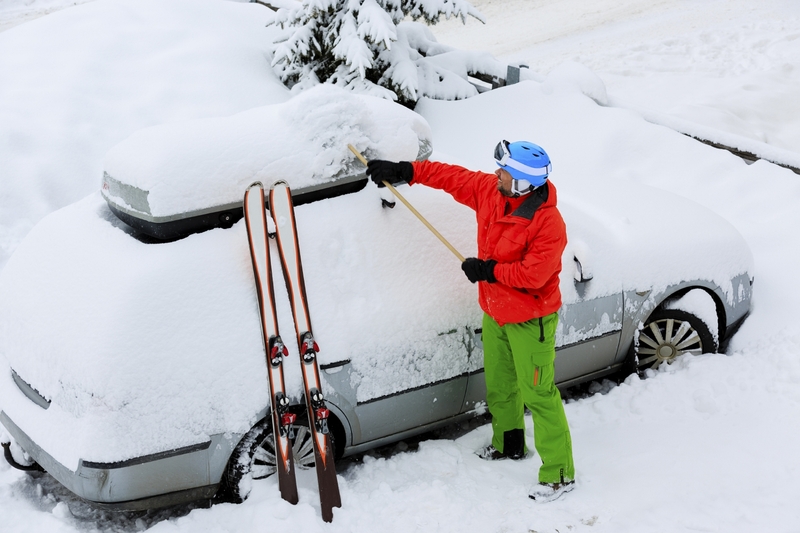 Those thinking about driving to their skiing or snowboarding holiday need to prepare in advance. That way they’ll have a greater chance of enjoying a trouble-free journey, in addition to time on the slopes. You need documentation for whoever’s driving as well as the car itself when motoring abroad. Make sure you’ve got your driving licence photo card. And if you have a co-driver (always sensible on a skiing holiday in case the driver has an accident on the slopes) make sure they have theirs too. You will also need proof that the car is yours and that it’s insured. Take your V5C registration document but make sure you photocopy it before you leave in case it goes AWOL. If you have a company car, you’ll need a letter from your fleet manager. You will also need a GB sticker, if your number plate doesn’t already have one. Although your regular UK motor insurance will cover you abroad, it will probably only be at the most basic level. Phone your insurer to ask how much extra European cover will cost for the length of time you’re away. Before you sign up, search the internet to ensure you’re getting a good deal. You should also get European breakdown cover, as it can cost more than £1000 to repatriate a car that’s conked out in a resort miles from the Channel. And if you break down on the way to your destination, you won’t be popular if it spells the end of your holiday before you get even a sniff of the snow. If you can, it’s a good idea to get a professional to check your car before you go. You may not do a large mileage normally so suddenly asking your motor to do a 1400-mile round trip might unmask some hidden faults. If your car is nearing its service, better to have it done before you go than hang on. At the very least make sure your coolant bottle is filled to the correct level, likewise your brake fluid. You should also check that you’ve got the right concentration of anti-freeze. A garage is able to do this and it’ll stop your car freezing up while it’s left in the resort. Your car’s handbook will tell you where all these are fluid containers live. Top up your windscreen washer bottle with the correct concentration of screen wash for a cold climate. The rubber at the four corners of your car is its connection with the road. At the very least check your tyres and make sure that they’re inflated to the correct level. Remember that you’ll probably be carrying extra luggage so they should be at the right pressure for carrying heavier loads. These will either be in the handbook, on the door pillar or inside the fuel filler flap. Winter, or all-season tyres are a good investment if you go skiing frequently. And you’ll be surprised at how much more grip they give on a cold, damp road. In some areas of the mountains you can be fined for not carrying chains during certain periods of the year. And when the road is snowy they can be a huge help. There are also products called snow socks and even a spray that helps your tyres grip in the cold. Auto Express tested all three types of product. Whichever you choose, make sure they’re easily accessible and not buried beneath piles of clothes in case you need them in a hurry. It’s also a good idea to practice putting chains or snow socks on at your leisure when you can see what you’re doing. When you need them for real, it’ll be freezing cold, possibly dark and/or snowing and you’ll probably be by the side of a road. It’s not the time to be messing about reading instruction manuals for the first time. Make sure you’ve got a torch with fresh batteries. It could help if you have car trouble or have to put snow chains on in the dark. A collapsible shovel is also sensible, as is a tow rope. And remember, while your car is in the resort, it’s likely to get covered in snow so some sort of scraper is likely to be invaluable. The rules of the road may be broadly the same throughout Europe but there are some local laws that you should be aware of before you travel. In France, for example, you need to have two disposable breathalysers. In Austria, you must carry a first aid kit. Both these countries, along with Belgium (which you may be driving through) and Italy, require reflective vests to be worn by anyone standing on the hard shoulder. Read about the rules of the road for individual countries here.